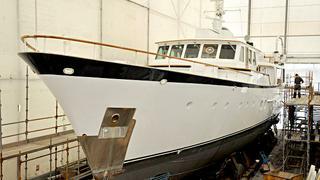 The 32.2m Feadship Heavenly Daze arrived at Pendennis at the end of September to commence her winter refit, due for completion in May 2012. Built by Feadship in 1972, with a reputation as a sophisticated classic motor yacht, the main focus of her visit is on her interiors, with significant restyling and upgrades to her saloon and dining area, as well as her VIP and guest cabins. Pendennis’ Interior Design team is supporting Wetzels Brown & Partners to restore the yacht’s original character while remaining true to her classic heritage. The refit will see the restoration of the yachts original fittings, with the addition of modern comforts and stylish accessories. Currently located in Pendennis’ 55m steel framed ‘White House’ refit space Heavenly Daze will also undergo an annual survey and general maintenance works with isolated deck and hull repairs, and top side repaint.